Beginning this proxy season, Institutional Shareholder Services (ISS) began to examine the reasonableness of non-employee director pay. The outcome of this examination could lead ISS to issue a negative vote recommendation on incumbent directors serving on the board committee responsible for setting director pay who are standing for election in 2019. Under its new proxy voting policy on non-employee director compensation, ISS will generally recommend shareholders vote AGAINST members of the board committee that are responsible for approving or setting non-employee director (NED) compensation if there is a pattern (i.e., 2 or more years) of “excessive” NED compensation without a disclosed compelling rationale or other mitigating factors. ISS is phasing in the new policy over the 2018 and 2019 proxy seasons. For this proxy season, ISS appears to be issuing cautionary notes to companies found to have “excessive” NED compensation. 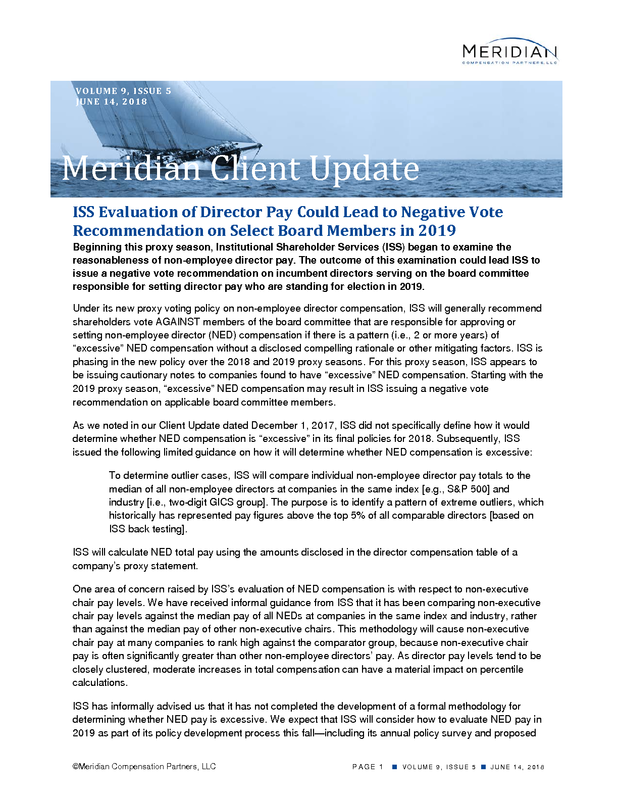 Starting with the 2019 proxy season, “excessive” NED compensation may result in ISS issuing a negative vote recommendation on applicable board committee members. To determine outlier cases, ISS will compare individual non-employee director pay totals to the median of all non-employee directors at companies in the same index [e.g., S&P 500] and industry [i.e., two-digit GICS group]. The purpose is to identify a pattern of extreme outliers, which historically has represented pay figures above the top 5% of all comparable directors [based on ISS back testing]. ISS will calculate NED total pay using the amounts disclosed in the director compensation table of a company’s proxy statement. One area of concern raised by ISS’s evaluation of NED compensation is with respect to non-executive chair pay levels. We have received informal guidance from ISS that it has been comparing non-executive chair pay levels against the median pay of all NEDs at companies in the same index and industry, rather than against the median pay of other non-executive chairs. This methodology will cause non-executive chair pay at many companies to rank high against the comparator group, because non-executive chair pay is often significantly greater than other non-employee directors’ pay. As director pay levels tend to be closely clustered, moderate increases in total compensation can have a material impact on percentile calculations. ■ Will ISS continue to evaluate non-executive Board chair pay levels against the median pay of all NEDs? ■ Will ISS solely focus on individual-by-individual NED pay comparisons or will ISS also evaluate the aggregate amounts of all NED pay at a subject company and comparator companies? ■ Will ISS develop the comparator group of companies in the same index and industry by applying size constraints relative to the subject company’s size? ■ Will ISS adopt thresholds for excessive NED pay levels to provide bright-line guidance on its NED pay comparisons and assessments? ■ What mitigating factors will ISS consider with regard to purportedly persistent “excessive” NED compensation if disclosed by a company? 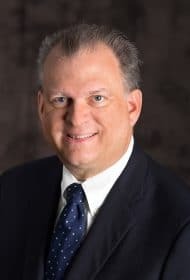 ■ Will ISS consider the timing of NED pay-setting decisions in determining whether a company has been responsive to ISS’s concern regarding NED pay? Meridian Comment. ISS’s evaluation of NED pay did not affect its vote recommendations on incumbent directors standing for election in 2018, except in the most egregious situations. However, if a non-executive chair continues to receive “excessive” pay levels in 2018 (as disclosed in 2019), ISS is likely to recommend that shareholders vote against the members of the board committee who approved such compensation if they are standing for re-election in 2019. To mitigate the likelihood of this outcome, companies should consider disclosing in 2019 proxy statements the rationale for the compensation awarded to the non-executive chair and other NEDs. Companies should also consider disclosing the NED pay-setting process, including any peer groups used to benchmark NED pay.